Red and black with gold accent, black belt, dragon print. Label says 38. Length 27". Permanent press. Pants length 40". Top length 28". Fabulous details! Excellent condition.never worn. Classic style, with braided trim and one pocket. Overall excellent condition, I think I see a couple super tiny moth holes, but only seen holding it up to the light. The original belt was missing, the one shown is not included. Near mint condition. Very well cared for. Armpit to armpit: 23. Their sizes varies from modern ones. The plastic has been dirtied but has done it's job and kept the pajamas clean. I try to describe it to the best of my abilities. Unless noted it is preworn. Up for grabs is a great 1960s pajamas. Length: (approx) 45 in. Pit to pit: (approx) 23.5 in. new mens Hanes tagless solid knit lounge pant sleepwear. 3 colors to choose. 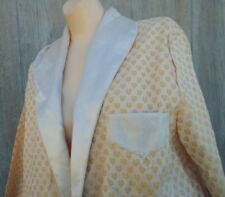 Up for grabs is a great 1960s possibly late 50s pajamas. The plastic has been dirtied but has done it's job and kept the pajamas clean. I try to describe it to the best of my abilities. Unless noted it is preworn. Size 38 Trunk 64. Made in USA. The body is rayon and the lapels, collar, and belt are acetate. Sleeve End: 19”. Underarm Seam to. Length: 37.5”. Vtg 50s 60s Brent Hollywood Short Sleeve Pajama Shirt Top Sz S VLV Mint Shape! Mint shape, nice pattern to it. Possibly unworn. ITEM #6046. 1950s-60s Satin Robe. Marked "50" / Fits like size Large in the shoulders. This appears to be barely worn. There is no belt present. Top is tunic styel with v-neck. Bottoms have elasticated wait and snap fly. Great hardly worn condition. Length: 27". Bottoms - Waist: 18" full stretch 22". Sleeves: 23". VIP Fine Luxury Rob by Nathan Negrin & Sons. 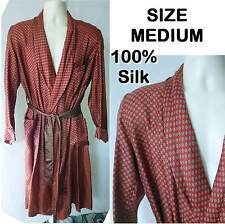 Lightweight Robe. Red ~ Blue ~ Yellow ~ White ~ Green Plaid. 65% Dacron, 35% Polyester. Shoulder to Shoulder: 27". Belt length: 60". Length from back of neck to hem: 46.5". 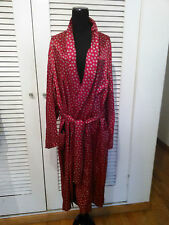 Fab vintage robe by Christian Dior in soft, burgundy velour. Wrapover style, 3/4 sleeves, front pockets, white piping trim, logo on lapel, adjustable belt. 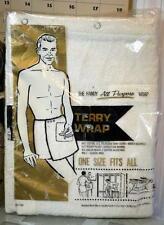 One Size - suits about 40-48" chest. Very good condition but shows light wear - see listing for full details, measurements and photos. Lots more Christian Dior in my shop!. Armpit to armpit: 27". length: 57". Long Sleeve Full Button Down Shirt w/ Long Button Fly Pants. Pants - 29" elastic waist (stretches to much larger), 27" inseam, 42.25" total length. Shirt - 20.5" pit to pit and 27.5" back of collar to bottom hem. Amazing color on this piece. It’s like an eggplant. It’s very well made and in perfect shape! Slight storage smell and could use an ironing. It has an inside button closure as well as the tie belt. Two side pockets and one chest pocket. Lined in a satin material. The shoulders have a slight padding to them to give structure. I took photos with a measuring tape, but please ask any questions you may have and I’ll do my best to answer.
" = Trouser Inside Leg. " = Trouser Waist. " = Sleeve length (from shoulder seam to sleeve edge). " = Shoulder (Seam to seam). " = Shirt/Tunic length (from nape of the neck to seam). 1501 - 2000g. 1001 - 1500g. Material is 75% Acetate 25% Cotton. Rare silk Victorian or Edwardian trousers. Peking to Paris Rally, Goodwood Festival, Fashionistas, Amateur Dramatics, Equestrian. - No size label fits as a 38 waist and 33 inside leg approx. Approximate sizes when laid flat. Vintage Men's TRICEL DRESSING GOWN ST MICHAEL 50s 60s green acetate MEDIUM M L ? Fabric: TRICEL - a triacetate/an acetate type fabric - quite silky to the touch - a beautiful soft fluid fabric. There is a separate label indicating that it's made from Tricel. Small hole along edge of one cuff. Color is royal blue with bright red piping. Seems a permanent press (poly/cotton blend). Excellent, clean, gently used condition with light wear, no holes, no spots. Calculator should show correct 1st-class option to Australia, Canada, France, Germany, Great Britain and Northern Ireland. DDR 70er Jahre Herren-Pyjama. Herren Pyjama Schlafanzug. "DREIKLANG". Christian Dior m en's One Size blue long sleeve robe. This robe features a belt around front and white piping accents throughout. Pit to Pit: 17" Pre-owned, in great condition. 70er - 80er Jahre. VEB Vereinigte Wäschefabrik -9700 Auerbach. VEB Vereinigte Wäschefabriken -9700 Auerbach. 1 Tasche auf der Vorderseite. made in DDR. mit Eingriff. long-sleeved shirt and long pants. Pre owned, shows general wear and age. Cool worn in aged look to it. shoulders around: 17.5”. length: 38.5”. arm length (shoulder to hem): 21”. We do not represent the manufacture. We will provide a quote if necessary. Overall Length: 48" Sleeve shoulder area 22". Chest: 50" Sash: 72". Explain the problem. AFTER HOURS BY DIPLOMATOne Size-fits most. 100% Orlon acrylic. Waist: 19. Chest, armpit to armpit: 21. Length, from top of collar: 25. Shoulder to shoulder: 18.